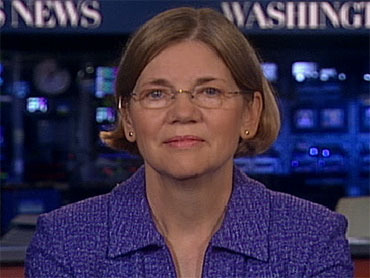 Republicans are expressing their dismay over the news that President Obama has tapped Elizabeth Warren as "special adviser" to a new Consumer Financial Protection Bureau, arguing that naming her to the post - a move that means she won't have to undergo a potentially lengthy and divisive Senate confirmation process - is "an affront" to transparency that subverts the guiding principles of the agency. Warren will be given the dual role of assistant to the President and special adviser to the Treasury secretary, which, according to a White House official , means that while for the next twelve to 18 months Warren will have oversight over the bureau's creation, she is not likely to be nominated as its director. "By not allowing Ms. Warren's nomination to be considered through the regular order of the full Senate confirmation process, the administration has circumvented one of the very few checks on a big new agency that already has been given an unprecedented concentration of regulatory powers," said the Chamber of Commerce's David Hirschmann, in a statement released this morning. "This maneuver is an affront to the pledge of transparency and consumer protection that's purported to be the focus of this new agency." Republican Senator Bob Corker of Tennessee also pushed back, protesting the administration's "circumventing" of the confirmation process in a letter to the President released shortly after Warren's appointment was leaked last night. "It is a key responsibility of the U.S. Senate and its committees of jurisdiction to advise and consent and one that I believe was not meant to be abdicated by the Executive Branch's use of appointments," Corker wrote, adding that given the recent creation of the position in question - "unprecedented in the nature of its unfettered and unchecked authorities" - the confirmation process was particularly important. The appointment of Warren to a special advisory role at the newly-created Consumer Financial Protection Bureau - a watchdog organization that was part of the Wall Street reform bill passed this summer - comes after weeks of speculation that the Harvard professor, widely believed to be Democrats' top choice for the spot, would face a tough confirmation process in the Senate. Mr. Obama is expected to officially announce his decision this afternoon, but Warren has already "enthusiastically agreed" to serve in the role, writing on the White House blog this morning that as of "right now" she was ready to help level the economic playing field in order to repair a "gaping hole in the budgets of millions of families." "This new bureau is based on the simple idea that if the playing field is level and families can see what's going on, they will have better tools to make better choices," Warren wrote. "It's time for all of us to pull up our socks and get to work."